SANTA CLARITA, Calif. (KABC) -- The massive Sand Fire is now at 65 percent containment after charring nearly 60 square miles in the Santa Clarita area, officials said. 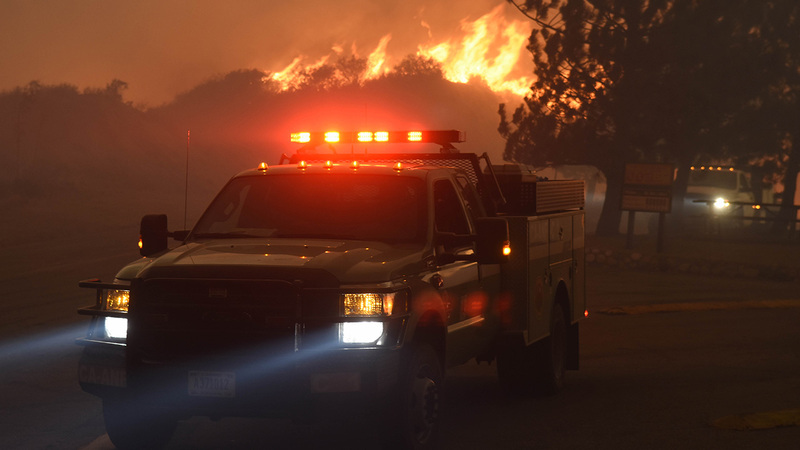 By Thursday morning, the blaze had scorched 38,346 acres, authorities said. The containment is up from just 40 percent on Wednesday. Acting Gov. Tom Torlakson declared a state of emergency Tuesday for Los Angeles County to provide more resources to firefighters and aid to victims. More than 2,700 firefighters from multiple agencies are working day and night to calm the blaze, which quickly exploded when it first broke out Friday afternoon. Other resources battling the fire include 214 engines, 63 hand crews, 11 water tenders, 20 helicopters and 35 dozers. Most evacuated residents have been allowed back home. Also, more than a dozen big cats are back home at the Wildlife Waystation in Sylmar. One person was killed in the fire, which also burned 18 homes. - All residents along Placerita Canyon Road from Running Horse Lane to Pacy Street. - All residents along Little Tujunga Canyon Road from the Wildlife Way Station to Sand Canyon Road and Placerita Canyon Road. Evacuation centers were set up at Hart High School, 24825 N. Newhall, Santa Clarita and at Highland High School, 39055 25th Street West, Palmdale. Large animals should be evacuated early in the morning to avoid congestion and allow access to firefighting equipment, officials said. They can be evacuated to Antelope Valley Fairgrounds, 2551 W. Avenue H, Lancaster and Pierce College, 6201 Winnetka, Woodland Hills, Hansen Dam, 1798 Foothill Blvd, Lake View Terrace. About 770 large animals were in the care of Los Angeles County Animal Care and Control. Small animals can go to Hart High School and Castaic Animal Shelter, 31044 Charlie Canyon Rd, Castaic. For a full list of road closures, you can check http://dpw.lacounty.gov/roadclosures.